I am absolutely certain that everybody reading this article is very familiar with a stuffy nose. The symptoms range from annoying to mildly debilitating. Your nose will feel stuffy and blocked, you have difficulty breathing and speaking. When you do speak, which many of us have to do in our jobs, your voice sounds damn strange. Yes, we have all been there–but now what? In the article below we review how to get rid of a stuffy nose with natural home remedies. What causes your stuffy nose? Sleeping becomes difficult and results in daytime tiredness and lethargy. You might also experience sinus pain and a build- up of mucus in your nasal passage. 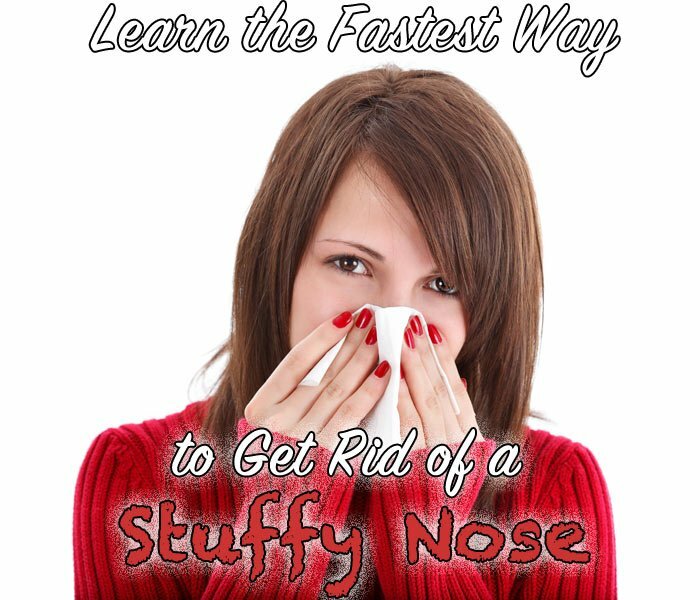 Stuffy nose is often accompanied by a runny or dripping nose. Most of these symptoms are no more than a nuisance but it is possible that when left untreated a stuffy nose can lead to other complications like ear and sinus infections. A stuffy nose, also known as nasal congestion occurs when nasal tissue and blood vessels are swollen from excess fluids. A stuffy nose is often caused by the common cold the flu or sinus infections, but can also happen as a result of hay fever, allergies, environmental irritants and tobacco smoke. I have read in a number of articles that adults are likely to catch the common cold between twice and four times a year. I seem to be lucky in this respect; I honestly can’t recall the last time I picked up a cold. The same can’t be said for my two young daughters, one or both of whom seem to be semi-permanently afflicted. Blowing your nose will not work. Typically, a stuffy nose has nothing to expel and trying to do so will likely make your congestion even worse. If you blow repeatedly, your nasal cavities are likely to become even more inflamed which will only lead to increased stuffiness. You could of course take a trip to the local pharmacy to buy a nasal spray with Oxymetazoline. Most of these sprays are only short-term fixes. The sprays typically they only last 30 minutes before they start wearing off. They can also be addictive and cause restlessness at night. The worst part is that if used for even three straight days they can cause a “rebound” effect where the congestion actually is worse than it was to start with. Avoiding over-the-counter sprays is probably a good idea since the bad typically outweighs the good. Obviously far more care needs to be taken with very young children as they may have difficulties breathing and eating. For older kids and adults there are a number of convenient and effective homemade treatments for stuffy nose. Staying hydrated is very important at all times and especially so when your nose is stuffed and you are feeling under the weather. Most all liquids, water, fruit juices, tea and so on will be effective in combating your symptoms. Liquids work by thinning the mucus in your nasal passage and easing the pressure on your sinuses. This in turn leads to a reduction in swelling and irritation. Be sure to drink plenty. A hot steamy shower is a simple and convenient way to ease your breathing. The steam reduces inflammation by thinning the mucus in your nose and sinuses. By reducing inflammation, your sinuses open up slightly helping you to breathe far more comfortably. Filling your sink with hot water and breathing in the steam will be equally as effective. Simply fill your sink with hot water, put your head over the sink with a towel above your head. When the steam has built up, inhale deeply for around ten minutes, being careful not to burn your skin. You could add a few drops of eucalyptus oil to your steaming water. Studies suggest that eucalyptus oil effectively reduces phlegm. 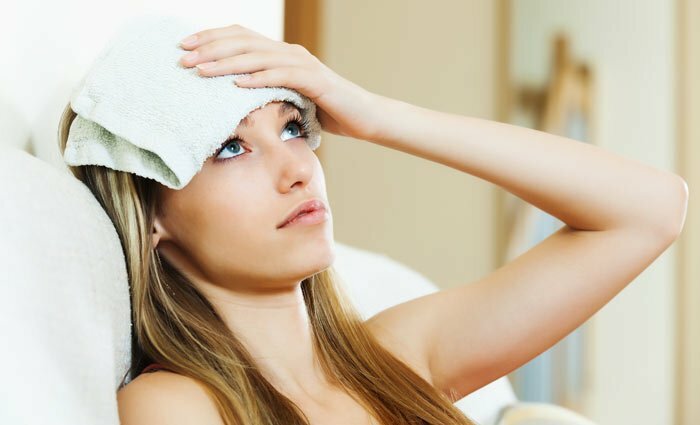 Steam treatment is only a short-term relief—and the benefits wear off after 20-30 minutes. Humidifier machines increase the level of humidity in your room by converting water to moisture. The effect on your breathing is similar to inhaling steam from a shower. Breathing in the moist air will ease your symptoms by reducing the mucus in your nose and sinuses, relieving swelling and irritation. This should return your breathing to normal fairly quickly and effectively. A soothing warm compress works in a similar way to a steam treatment. It relieves your symptoms by reducing inflammation and opening your nasal passages. While steam opens your passages from the inside, a warm compress does the same job externally. Simply grab a clean towel and soak it in warm water. Wring out the water until the towel is just damp. Fold the towel and apply it to your face making sure that it touches your forehead and nose. This is a very simple, convenient treatment and can be repeated whenever necessary. 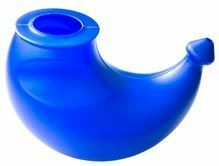 I have to be honest; I hadn’t seen or heard of neti pots until I saw my boss at work using one on her young daughter. Far from being a new invention, neti pots have been used in Asia for many hundreds of years and are readily available at most pharmacies these days. They are relatively inexpensive, totally safe to use and extremely effective. They work by rinsing your nose out from one cavity to the other. Be sure to use bottled or sterilized water as opposed to tap water. Sterile water is even recommended by the Food and Drug Administration (FDA). Tap water might cause infection. Simply insert the spout end of the device into your nostril at a tilted angle over the sink. The water will enter your nasal passage and come out of the other nostril. Repeat the routine from the opposite nostril to ensure you expel any mucus and other irritants. 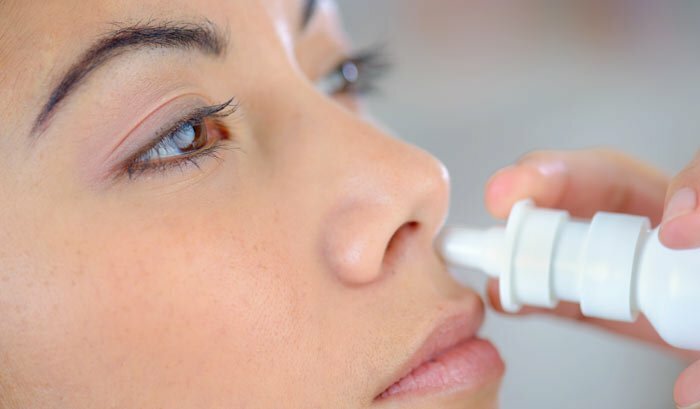 Saline sprays work by increasing the level of moisture in your nasal passage and reducing and thinning the mucous. This decreases the swelling of your blood vessels and helps to clear your nasal passage of fluids. While you can buy saline sprays over the counter at the pharmacy—make sure it is saline only. Some saline sprays come with decongestant (typically Oxymetazoline) or other medications which could worsen your symptoms. If you are wary of the medications used in saline sprays, it is easy enough to make your own at home with a few readily available ingredients. Add two or three teaspoons full of salt (non-iodized) to a pint of distilled or sterilized water and mix it well. Gently squirt the mixture into your nostril aiming at the back of your head; then gently blow your nose. Repeat the process with your other nostril. This simple solution should have you breathing more comfortably fairly quickly. Many people dislike garlic, it certainly has a pungent odor and a very strong flavor. I personally love the stuff and it is widely considered to be a remedy for a number of health issues including protection against the common cold and as a treatment for congestion. A British study showed that participants given garlic supplements over a 12 week period developed significantly fewer colds than the control group. I cook with garlic often and it can be added to a variety of dishes. If you are not keen on the taste, you could use it in a steam treatment. A number of Essential oils can be used that provide relief. I will try and break out the top choices along with similar alternatives. Menthol is the main ingredient in peppermint oil. Menthol is used as an additive in many vapor rubs used to ease congestion. Peppermint essential oil should have the same or better effect. To use you can just dab a couple of drops of peppermint oil under your nostrils. You should find your breathing becomes easier. You could also diffuse peppermint oil in a diffuser. A 5% or less dilution ratio would be recommended (which equals about 30 drops of oil per ounce of carrier oil). Another option is to add a few drops of peppermint oil to a bath. Wait until the water is done running to make sure you don’t speed the diffusion process too much. Or a few drops into a sink of warm water and hold your head over the sink with a towel wrapped around. Whichever option is the most convenient option for you is the best. The best treatment is the one you actually use. A tasty alternative is peppermint tea. Having your peppermint in a tea combines some of the steam benefits (inhale it first), with the benefits of peppermint. A good alternative to peppermint is spearmint. Spearmint is the same genus as peppermint and has many similar qualities and compounds. Apart from peppermint essential oil, a number of other essential oils may help provide relief from congestion and stuffy nose. The following essential oils are considered to be the best but are by no means the only essential oils that can help. Tea tree essential oil is considered to be one of the most powerful and effective oils. It is highly antiseptic and antimicrobial and has a variety of applications including its ability to ease congestion and treat coughs and sore throats. This wonderfully scented oil is a great remedy for congestion and other respiratory conditions. It possesses antibacterial, antiseptic and analgesic properties perfectly suited to relieve congestion and reduce the build-up of phlegm. Eucalyptus Essential oil also provides many similar benefits and could be dosed and used in a similar manner. Some oils with similar properties and benefits are Niaouli, Bay Laurel, Ravintsara and Cajeput. This is a very strong smelling oil but one of the best essential oils to deal with congestion. Like so many other oils it has a variety of therapeutic properties. It is antibacterial, antimicrobial and is a great remedy for phlegm, mucus and clogged up sinuses. Thyme oil is another extremely effective essential oil to treat your stuffy nose. It is a very potent antibacterial and antiseptic oil that works really well when trying to treat sinus complaints, colds and congestion. Other effective essential oils to deal with a stuffy nose include lemon, pine and rosemary essential oils. Rub a few drops of oil diluted with a carrier oil into your neck, chest and sinus regions. Inhale directly from the bottle or from a handkerchief. Perhaps the most effective method of treating a stuffy nose is to add 5 or 6 drops of your chosen oil into a sink full of hot water and make your own steam bath. Cover your head with a towel and inhale the rich vapors for 5 minutes or so. A famous University of Nebraska Medical Center study showed that Chicken Soup has modest but measurable anti-inflammatory ability. Technically, it inhibits neutrophil chemotaxis, which is responsible for mucus production. The overall benefit is this can reduce swelling and inflammation of the sinuses. Among the many benefits of Apple Cider Vinegar is its ability to thin mucus. Add a couple of teaspoons of ACV to water and use as a tonic. This will benefit overall health. For more immediate relief mix 50/50 with water and use as a steam treatment. Apple Cider Vinegar is an effective neti pot rinse: mix 2 tablespoons ACV to 1 cup of warm water. Make sure to use raw, organic ACV with the “mother”. More of the many health benefits of Apple Cider Vinegar are here. I cannot personally vouch for this but many people claim to find coconut oil effective in relieving congestion and similar symptoms. What we do know is that coconut oil is extremely healthy and has a range of outstanding health benefits due to its unique chemical composition. How it might work when applied topically for stuffy nose is less clear but some say it is down to the lauric acid content of the oil. To use coconut oil for your stuffy nose, simply warm a small amount of virgin coconut oil in your hands and apply it to either side of your nose. Let it sit in place for 5 minutes or so and with any luck it will ease your nasal congestion. Because it is so natural and safe, you can happily use it to treat your children too. Green tea is an especially rich source of anti-inflammatory flavonoids but black tea can be used with decent effect too. If you add a good sprinkling of crushed pepper to your tea, it can enhance the effect because it increases the effect of the tea alone. Sipping on a hot cup of tea infused with pepper helps your stuffy nose because the rising hot vapors enter the nostrils and the powerful compounds can get to work to ease your congestion. The added bonus is that green tea is an incredibly healthy drink and tastes delicious. Ginger tea can have a similar effect on your stuffy nose as the effect of discussed above. You can either prepare your own tea with ginger root or buy a pre-prepared ginger tea from your local health store or supermarket. Fenugreek seeds are said to be an excellent remedy for a stuffy nose and other respiratory complaints. Fenugreek seeds are also said to benefit digestive disorders, liver complaints and menstrual cramps. You can easily make your own fenugreek seed tea by following a few basic steps. Add a tablespoon of fenugreek seeds to a cup of boiling water. Allow the mixture to seep for around 30 minutes in order to get its full therapeutic impact. A simple technique to try is to use acupressure points to relief congestion. The video below shows the basic technique. All of the above treatments are perfectly safe and convenient remedies for your stuffy nose. Before you hit the pharmacy and try a chemical option—try Mother Nature first. I have found that the natural options require a little more work and preparation but typically work better for stuffy nose relief. Did we miss anything? How did these remedies work for you? Join the conversation and let us know!